As a long time scrapbooker, Handmade Greeting Cards is a great way for me to use my leftover scraps. Not only can I use my scraps of paper, but my fibers & ribbons, stickers, embellishments, rubber stamps and embossing tools can all be used in the process of creating some beautiful Hand Made Greeting Cards. Whether you want to go simple or very elaborate, giving hand made greeting cards, can send a very special message to your recipient. I have put together a few pages here to help you move into card making, whether or not you are a scrapbooker. I will start you out with a simple Quick Start Guide to Making Hand Made Cards that would be a good place to start. This page will tell you about features and the main points to make your overall card design with some samples plus the Tools, Supplies and Embellishments you will need for great cards and envelopes. There is even a source or two for finding blank cards and envelopes that I order from - Paper Source. We also have some information to a Handmade Background Tutorial that will give you a unique place to start if you do not have a stash of scrapbook paper to choose from. For the very simple cards, check out our basic Card Making Ideas. If you are a beginner, these sample cards are made with some leftover scrapbooking papers, a few stamps and some tags for journaling. You can also learn about World Card Making Day, the first Saturday in October. If you are already into some Handmade Greeting Cards, move ahead to some more advanced techniques. If you will need to make a bunch of cards for sending out for the holidays, for an event, or for party invitations, here are some quick and easy ideas for Assembly Line Card Making. This page will give you some ideas for cards and matching envelopes, making the greetings for the cards, and finishing up with Die Cutting, Embossing & Embellishments. I have assembled a group of Card Makers Resources that have ideas, and techniques in the form of Magazine subscriptions with 4 or 6 issues per year as well as Card Making Kits from several sources that arrive monthly with everything you need to make from 6 to 12 cards monthly. Several of these come with recommendations based on personal experience. Another option for great Card Making Resources is Annie's. For some quick and easy Christmas Card Making Ideas, we have put together an easy Tutorial for card making using the Cloisonne Rubber Stamps from Michael Strong with a unique idea of recycling magazine photos. 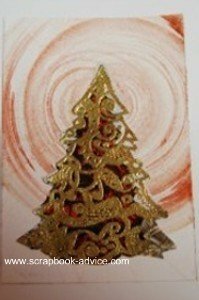 The Handmade Greeting Card samples show his Cloisonne Christmas Trees, The Cloisonne Circle, and Cloisonne Ornaments. 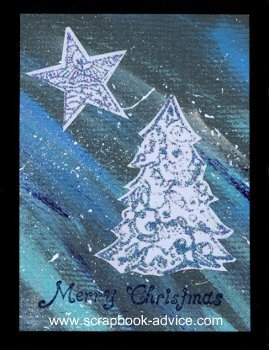 I have another page with Christmas Card Making Video Tutorials that can be used for Hand Made Cards for any occasions. These include such card folding techniques at a Herringbone Fold Pocket Card, a Tri-Fold Envelope Card, a Tri-Shutter Card Tutorial, a Squash Book, and techniques such as Faux Silk Finish Technique, a trick for a perfect Flat Ribbon Bow, and using Spellbinders Impressibilities in several ways for enhancing your cards. Toward the end, I have a Card Making Do Not Do List. This is just a simple list of things you might want to think about or avoid in your card making, especially if you intend to mail your cards. And lastly, how about posting some of your cards to show off a technique and compete for a prize at the Readers Card Gallery.